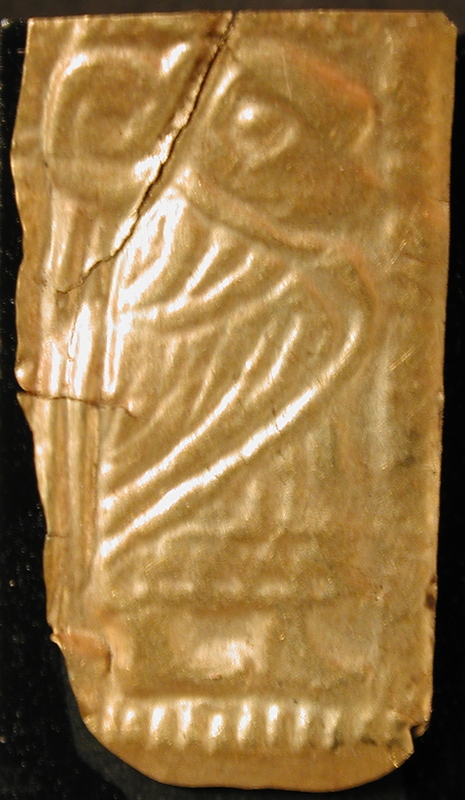 This theory is also based on archaeological evidence. The guldgubber were found around post-holes – if found in a building – and were probably placed on the post for display. They were made in a large quantity and therefore probably used or at least theoretically needed a lot. During the Viking Age many Scandinavian people travelled a great deal – for business and raids. Before that, however, small raids were already taking place, as monastery books document, and it is quite probable that a lot of people travelled then as well. It is also natural that people died during that era, possibly also on a journey. So it is possible, that guldgubber symbolize the memory of the dead or travelling people. To the people of the pre Viking Age, death was just another journey to the otherworld. 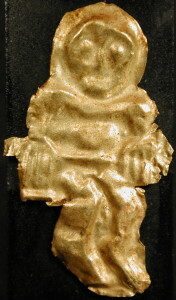 A guldgubbe from subcategory [D-I] could be taken and placed on a post for display. 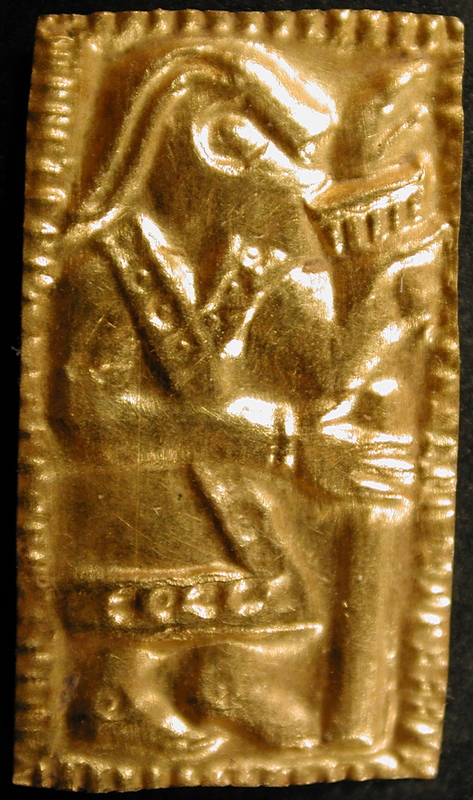 The person on the guldgubbe could represent an ancestor who had died quite a while ago and therefore is depicted in a more ghostlike style. It might have been the day that person died or a special holiday on which all people remembered their ancestors or the people who had died. They placed the gubbe on the post and probably made a kind of wish for their good in the otherworld (however the otherworld might have been in their belief – but the graves found make it likely that there was some kind of otherworld or afterlife). A guldgubbe from subcategory [A-V] could be taken for a recently deceased man – husband, father, brother or son. The guldgubber from that subcategory depict men who make no gestures and do not interact with anyone. The memory of the dead person is more vivid than that of the ones who died several years ago. A gubbe from subcategory [B-II] could be used for the same reason, depicting only a woman – wife, mother, sister or daughter. They could both be placed on the post on the same occasion as mentioned above or during a feast or burial ceremony. 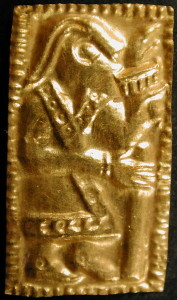 Other guldgubber could be used in memory of travellers. A guldgubbe from subcategory [A-I], a man with the Sturzbecher, could symbolize a wish for a prosperous journey, as in medieval times drinking completed a contract (the arrha in German laws). Whether the journey was a journey to another country or to an otherworld has to be decided by the reader; both are likely.